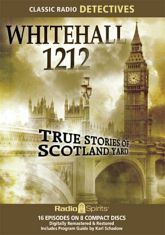 For crime, mystery, and thrills, dial Whitehall 1212! That was the phone number for Scotland Yard�and that's the title of this exciting series. Presented are sixteen stories of investigation, drawn from the files of London's Metropolitan Police Force -- written, directed and produced by radio legend Wyllis Cooper. Harvey Hays stars as Chief Superintendent John Davidson, Custodian of The Black Museum. He is joined by an "all-British cast," including Horace Braham, Lester Fletcher, Pat O'Malley, Guy Spaull, Patricia Courtley, and more.